Most power drills and cordless drills utilize a chuck (either keyed or keyless) with three movable jaws on the end of the motor spindle to hold onto drill bits and screw tips. With repeated use, particularly in situations such as a construction site where the potential for the tool getting beaten up is prevalent, the chuck can become damaged and need to be replaced, with either a new keyed or keyless chuck. The following steps will allow you to remove the old chuck and replace it with a new chuck of your choice. 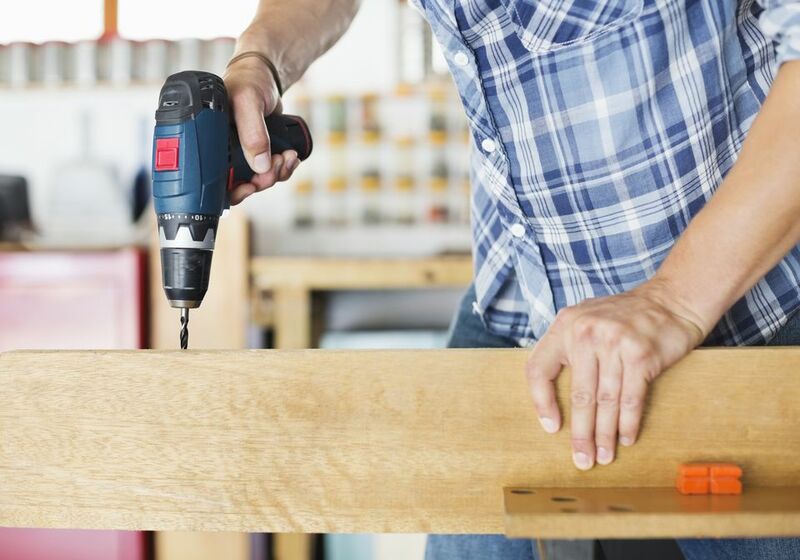 There are some drills, particularly small cordless screwdrivers and impact drivers that use a 1/4-inch, non-adjustable bit, so this tip would not apply to such a unit. Most handheld drill chucks are tightened into place on a threaded spindle that is connected to the drill motor, and is then held in place with a set screw (often a Phillips head, Torx head or Allen head screw). However, in the case of a drill press, the chuck is likely a pressure fit onto a tapered spindle, which is an entirely different procedure than the steps outlined here. The way to tell which type of chuck your drill uses is to open the jaws to the widest point of separation and look into the base of the chuck with a flashlight or other bright light. If you see a screw in the bottom of the chuck, note the type of screw head, so you will know what type of screwdriver or wrench will be needed to remove the set screw. If there is no screw present, then you likely have a tapered spindle, and these steps will not apply to your drill. To begin, insert the tip of the screwdriver or wrench into the screw head within the chuck. This will be a reverse-threaded screw, so you will need to rotate the screwdriver or wrench clockwise while holding the chuck firmly with the other hand to remove the set screw. Once loose, pull out the screw and set it aside for the time being. To remove the chuck, find a 3/8-inch Allen wrench, and tighten the short side of the wrench into the drill chuck. Then, if your drill has a two-speed setting, flip the switch to the low speed. If your drill is equipped with a chuck clutch, be sure to set the clutch on the highest setting, and set the drill direction indicator to forward (the same position for drilling with a drill bit). Next, place the drill firmly onto a work table, and hold it in place with your left hand. Adjust the position of the Allen wrench in the chuck so that it is at about a 45-degree angle, pointing toward your body, and give the wrench a good whack with a hammer. The chuck should now be loosened from the spindle and can be rotated off of the spindle by hand by turning it counter-clockwise. What if Your Chuck is Damaged? One common question with this procedure is, what if the chuck is damaged and will not clamp down onto a large Allen wrench? There are a couple of options in this case. First of all, if your chuck is a keyed chuck, you can put the key into the chuck and smack the key with a rubber mallet. Be aware that there is the potential for damaging the chuck or the chuck key with this procedure, but since the chuck is already damaged, it may be a moot point. Another option that can work on either a keyed chuck or a keyless chuck is to lock a large pair of locking pliers (such as Vise-Grips) on the frozen chuck and then smack the wrench with a rubber mallet. Once the chuck is loose, you can spin it off in the same manner outlined in the previous step. Once the old chuck is off of the drill spindle, you can measure the spindle threads (if you cannot obtain them from the drill manufacturer's website or the drill owner's manual) for purchasing a matching chuck. To install the new chuck, simply position the threads of the chuck (be it keyed or keyless) on the spindle and spin the chuck clockwise until hand tightened onto the spindle. Then, open the jaws of the new chuck, re-insert the screw that you removed earlier into the hole at the base of the chuck and tighten the screw into place. At this point, your new chuck is ready to use. Be aware that after your new chuck has settled onto the spindle with some use of the drill, you may want to re-tighten the screw, as it may seem slightly loose after a bit of initial use of the new chuck.